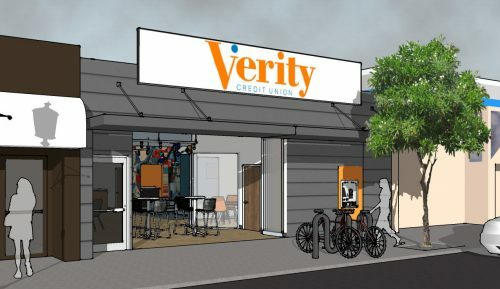 Verity Credit Union is partnering with Momentum to deliver a new West Seattle location in the Alaska Junction neighborhood. 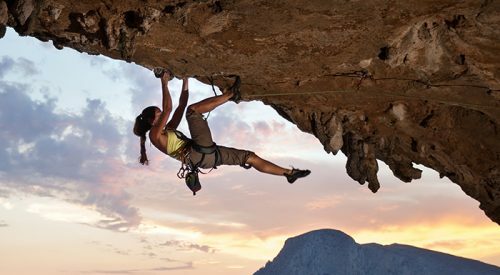 Verity is known for its community engagement and extremely localized branch experiences. Their neighborhood-centered locations showcase local artists, and the credit union organizes events, fundraisers, and volunteer opportunities in the communities around their branches. Last year, Verity’s staff logged over 2,800 volunteer hours, an average of over six days per employee. The new branch will feature a more casual café style layout, with bistro tables and a kitchen counter style “tool bench” replacing teller lines and offices, and instead of a typical segmented staffing model the branch staff will be trained to handle a wide variety of interactions and services. 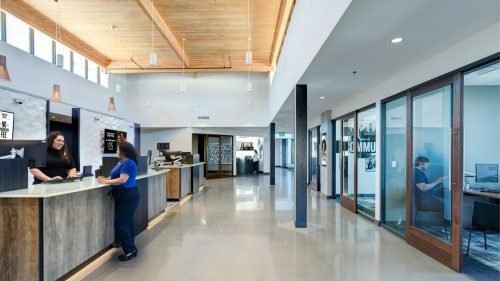 “These informal spaces have served Verity Credit Union well in their desire to help members feel relaxed and open up more about their financial needs,” said Jenny Bengeult, Momentum’s Design Director. The design aesthetic will merge Verity’s brand with elements that embody the atmosphere of West Seattle, and a unique retractable glass wall will open the branch space up further for community events. 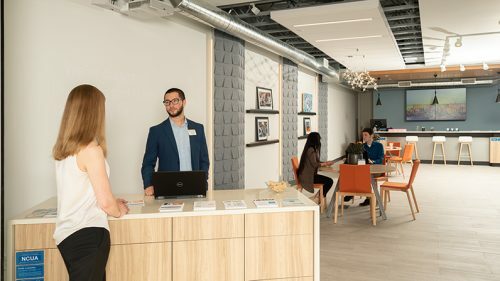 “Momentum is proud to help Verity establish their presence in West Seattle, replacing a national chain store that previously occupied the Alaska Junction location with a locally administered community financial institution, and it will be great to have them in my neighborhood,” said Momentum’s Jay Speidell, a West Seattle resident. The new Verity branch will offer residents a local alternative to the regional and national financial institution branches that are common in the Alaska Junction neighborhood. Verity has been serving members of the greater Seattle area since 1933. Verity’s mission is to enhance members’ lives by creating trusted relationships, empower their financial lives, and promote strong and viable communities. The credit union lives this mission by working with local bands and artists to help embody the feel of Seattle. Anyone living in Washington State can become a member.